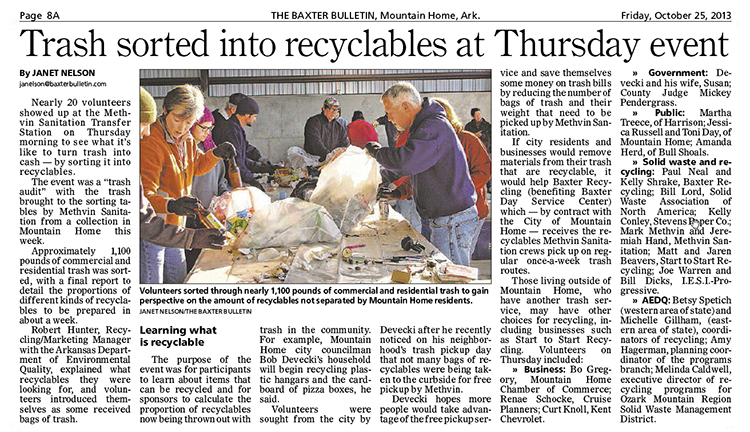 November 13th, the City of Cotter held a ribbon cutting to celebrate the start of its recycling program with Ozark Mountain Solid Waste District. Huge blue bins will set on the street in front of Cotter’s City Hall, every second Tuesday and Wednesday of the month for the public to recycle paper (also magazines), plastic and aluminum. 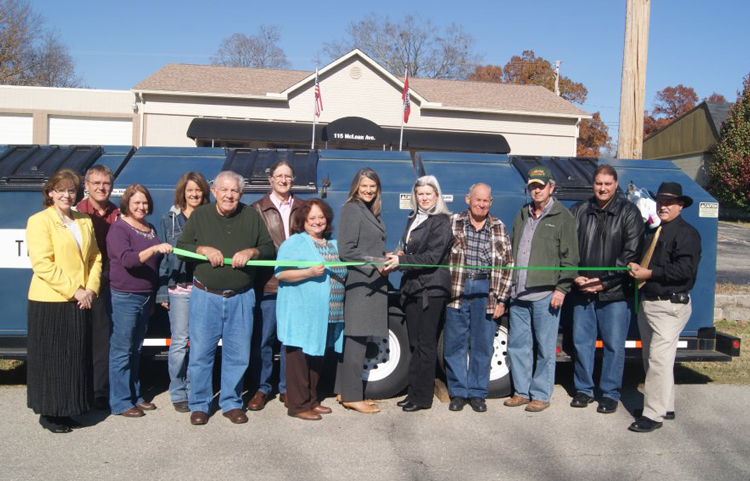 Melinda Caldwell, Executive Director of Ozark Mountain Solid Waste District, along with two employees of the Mountain Home office, Kelli Shrake and Paul Neal, attended the ribbon cutting with Mayor Peggy Hammack, City Hall personnel, Councilmembers, and Gassville’s Mayor, Jeff Braim. 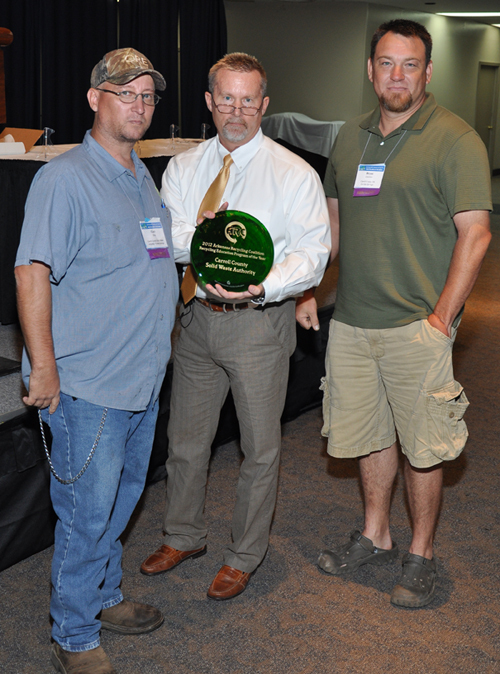 The Arkansas Recycling Coalition (ARC) held its annual awards presentation at the Robinson Center, Little Rock, on September 13th. 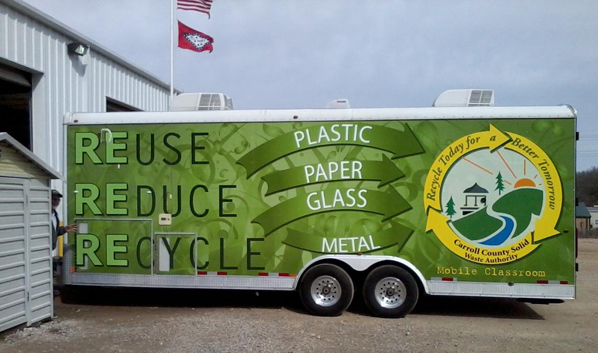 The presentation took place during the Arkansas Recycling Coalition’s 22nd Annual Conference & Trade Show. Each year this educational event attracts approximately 300 reduce, reuse, recycle, and sustainability professionals from around the state and nation. Carroll County Solid Waste Authority located in Eureka Springs was a recipient of ARC’s 2012 Recycling Education Program of the Year Award. This award is presented to the organization, school or individual that has established a proven Recycling Education Program, which offers an integrated approach incorporating source reduction, product reuse, recycling, and sustainability into a comprehensive educational program within a community or region. On hand to accept the award from ARC’s Awards Chairman, Bobby Fanning, is Gary Gray and Bryan Launius of CCSWA. 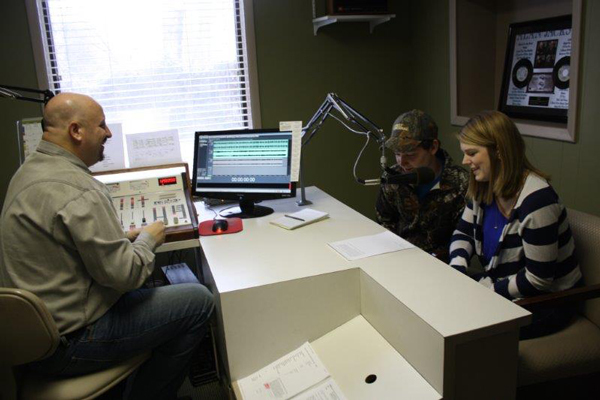 CCSWA won the award for the education trailer they created this year. Phil Jackson, Director of CCSWA, saw a need for education within the Authority and developed an educational trailer to help in their waste diversion efforts. The trailer is provided to schools and organizations in Carroll County, and includes a video explaining where trash and recyclables go, how recyclables are processed, and the reasons why we all need to focus on waste diversion. Other award winners were AR National Guard – Camp Robinson (North Little Rock) for Government Recycler of the Year; Cross County Special Workshop (Wynne) for Recycling Education Program of the Year; McKee Foods Corporation (Gentry) for Corporate Recycler of the Year; eSCO Processing & Recycling (Rogers) for Community Involvement Award; and Carl Davis, Davis Iron & Metal (Fort Smith), for Individual Recycler of the Year. A Distinguished Service Award was presented to Don Curran, Virco Manufacturing Corporation, for his many years of dedicated service to ARC and the community. Award Sponsors for this year’s event included Delta Plastics (Little Rock, AR), UNICOR Federal Prison System (Texarkana, TX), Lockheed Martin Missiles and Fire Control (E. Camden, AR), ORE-Recovered Materials (Clinton, AR), and Regional Recycling & Waste Reduction District (Little Rock, AR). Founded in 1989, the ARC unites companies, government agencies, nonprofit organizations, and individuals in a common effort to promote reduce, reuse, recycle, and sustainability as a primary means of waste management in Arkansas. 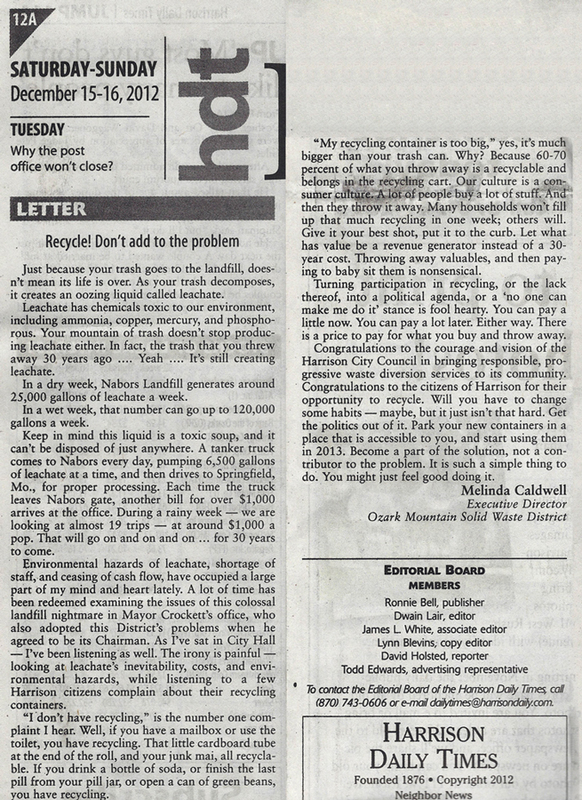 For more information, visit www.recycleark.org or call Cherie O’Mary, ARC Executive Director, at (866) 290-1429. Frequent visitors to the park are already familiar with the mesh bags provided (and required) for trash containment while on float trips. This year the concessions management program of Buffalo National River has purchased white mesh bags with the recycling symbol on it to encourage visitors to recycle aluminum cans. Park concessioners will provide these bags to visitors at the beginning of their float trips. Both the trash and recycle bags must be secured to the canoe or kayak during the trip so that they don’t end up in the river. At the end of the day, the bags containing aluminum cans may be deposited with the concessioner. Many of the parks campgrounds and launch sites have the standard blue dumpster for placing all types of recyclable materials, including plastic water bottles which are now a major component of river and roadside litter. In addition to the common sense of recycling, regulations govern the use of other materials on the park. Glass containers are prohibited on trails, in caves, on or in waterways, and within 100 feet of any river or stream in the park. There is a history of glass containers breaking on trails, in caves, in the river, and on gravel bars and it is difficult to clean up the shards. The waterways and gravel bars of the park are used by swimmers and canoeists who are usually barefooted. Glass containers are allowed in all developed campsites and picnic sites as well as in vehicles on designated roads and parking areas. The possession of polystyrene coolers, (commonly known as styrofoam) is prohibited while floating or camping along the Buffalo River, except in developed campgrounds, picnic areas, landings, roads and parking lots. This prohibition includes coolers, ice chests, and containers. High density bait containers, used solely for that purpose are allowed. Discarded polystyrene does not biodegrade, remaining a visual component of the environment for decades. The slow degradation of polystyrene also creates potentially harmful liquid and gaseous by-products that could contaminate groundwater and air. In addition to the prohibition, visitors should try to use alternative containers even in the campground: paper plates that can be safely burned, ceramic cups (the coffee tastes better). “Disposable culture” became part of the American landscape during and after World War II when the production of highly efficient materials to support overseas actions translated to a domestic market. House sites on the Buffalo prior to WWII tend to have very little trash associated with them as their occupants made use of containers until broken or exhausted. After WWII disposable containers became common on the landscape, first near houses, then in landfills. And as a consequence, our sensitivity to recycling rapidly evaporated. Decreasing our footprint on the landscape of the park, of Arkansas, and the planet, is a part of the mission of the National Park Service and we encourage all visitors to participate with us in this effort. 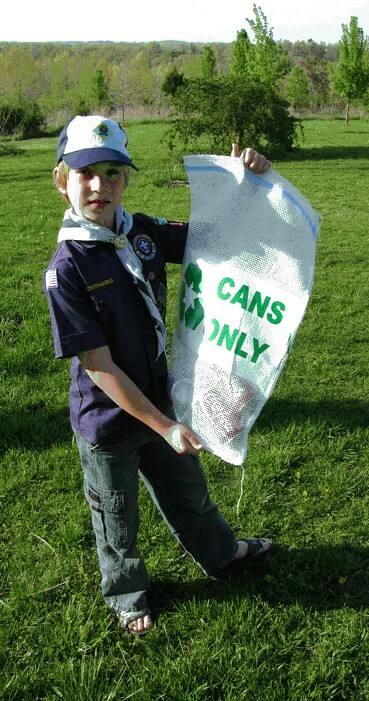 Cub Scout Eamonn Clark of Bergman Pack 179 models the new recycling bags. The City of Harrison and Buffalo National River have entered into a unique partnership to reuse and recycle horse manure. 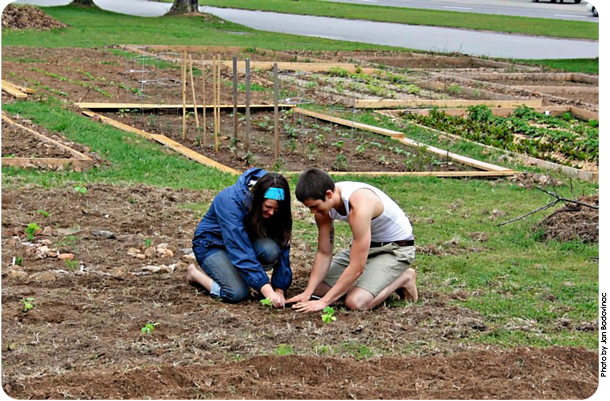 The direct beneficiaries include Buffalo National River and the Harrison Community Garden. 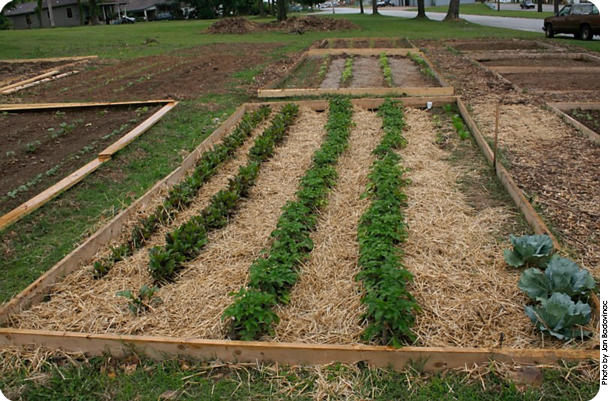 The Harrison Community Garden, located on the north side of Highway 62/65, directly across from Edwards Grocery, consists of a partnership of the City of Harrison, North Arkansas College, North Arkansas Partnership for Heath Education, and local volunteers. 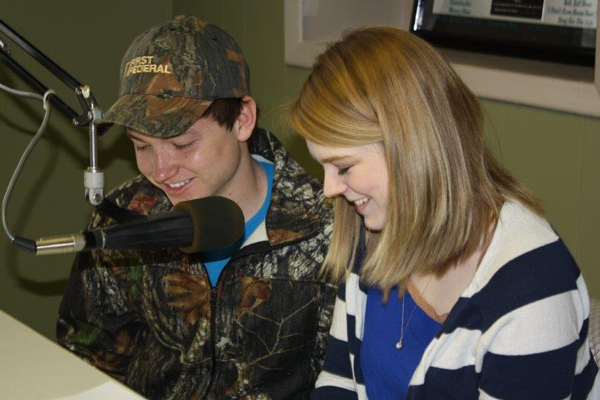 The City of Harrison has been instrumental in helping the group get established. Buffalo National River’s horse camp at Steel Creek offers park visitors an opportunity to camp with their horses and ride the horse trails in the park’s upper district. There are 14 horse campsites available at Steel Creek. 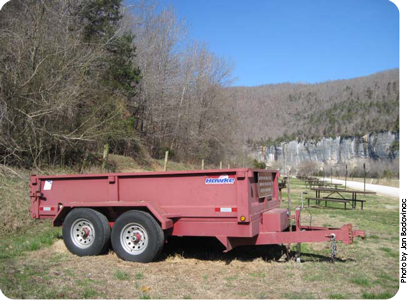 Campers are required to remove their horse’s byproducts from the campsite into a National Park Service-owned dumpster trailer so that it does not end up in the river, and the NPS was looking for a location to dispose of the manure. 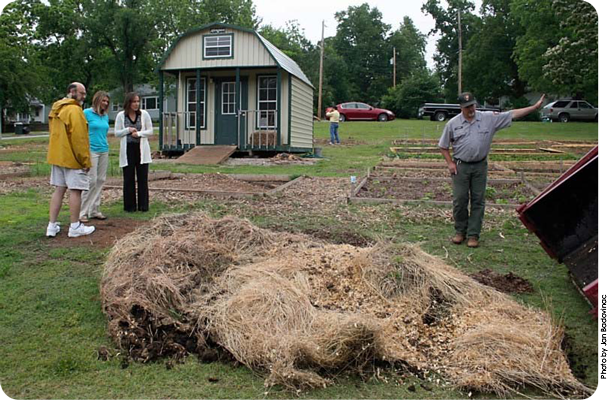 The Ozark Mountain Solid Waste District stepped in and assisted in bringing together Harrison’s Community Garden and Buffalo National River. 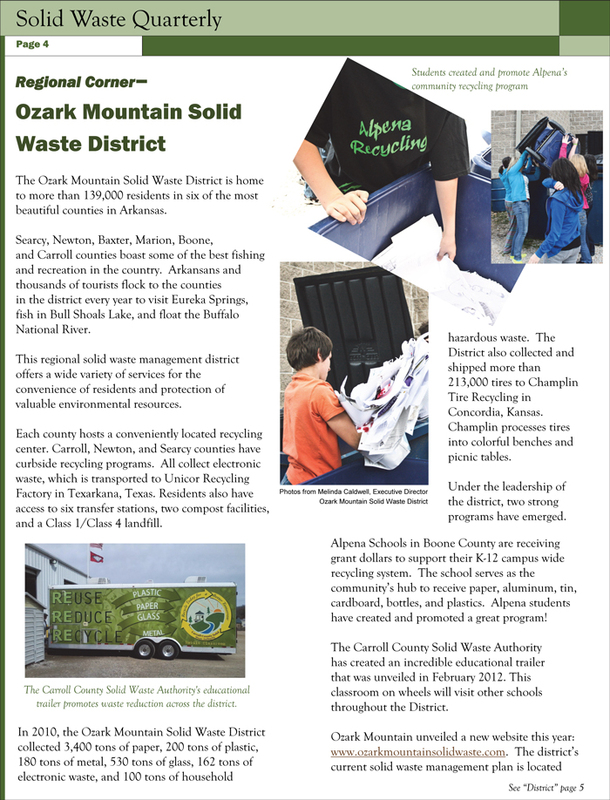 Ozark Mountain Solid Waste District’s role is to promote responsible handling of all solid waste, including the recycling of electronics, waste tires, and the recyclable material collected in the six-county district. The opportunity to help find a home for the horse manure collected at Steel Creek brought a whole new dimension of solid waste diversion to their repertoire of services. Knowing that manure would serve a much higher purpose providing nutrients to the soil in family gardens, this partnership is a win-win for everyone involved. Recycling comes in many different forms. Buffalo National River found a local home for a waste product generated by park visitors, the Community Garden has a constant supply of fertilizer, and the District was able to save landfill space by diverting material to where it benefits the community.